UPDATE: The full lineup has been released and it features everyone’s favorite 90s group, THIRD EYE BLIND and Made of Oak. Read on for the full set times. 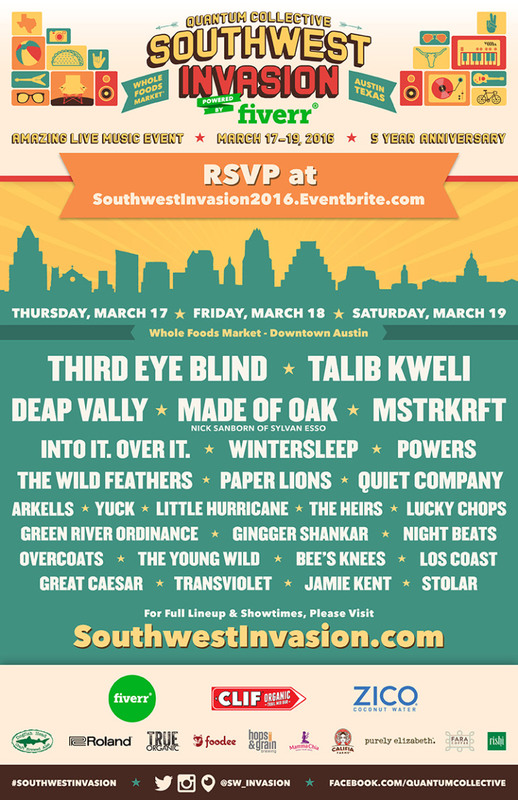 Southwest Invasion is back for their 5th year anniversary at SXSW for what’s looking to be another amazing 3-Day live event on the Whole Foods Rooftop Plaza. The 30+ artist lineup is rolling out over the next few weeks, but from the first reveal it’s looking to be pretty great. Performing this year are Talib Kweli, MSTRKRFT, Deap Vally and The Wild Feathers to name a few, with more acts to be announced in the coming weeks. I’ll update this page as soon as the rest of the lineup is released. Space is limited, so RSVP here to get your free ticket.